The objective of this study is to evaluate the suitability of a very low cost unmanned aircraft system (UAS) for environmental science research. A small grant was obtained (<$6500) to set up a complete UAS and to employ it to collect data in small montane meadows and hill slope gullies. The system comprises a 3D Robotics hexacopter, two Canon point-and-shoot cameras including one modified for near infrared (NIR) imagery. The collected data was used in an attempt to identify vegetation-obscured stream channels using NIR imagery and to calculate gully volume and erosion rates from digital surface models (DSM) created using Structure from Motion (SfM). The collected data was also compared against commonly used free data sources. This research shows that using consumer grade cameras converted to multispectral sensors for detecting small, obscured montane meadow stream channels was unsuccessful but with further development has great promise. However, compared to the use of other imagery, the centimeter level resolution and low cost for rapid repeat visits by the UAS may justify their use in montane meadow stream monitoring. 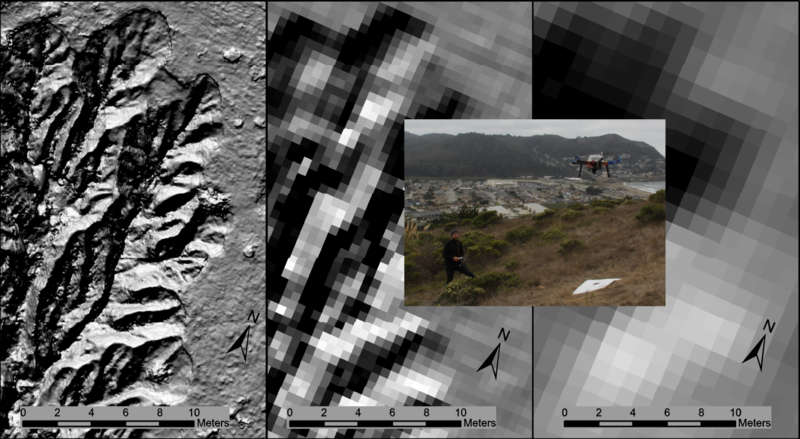 In the collection of gully data the resolution of the UAS derived SfM DSM can provide a precision for volumetric estimates substantially better than available public data. Additionally the ability to easily and cheaply repeat surveys and the fine resolution will make it possible to study erosion rates and estimate sediment yield through change in volume.